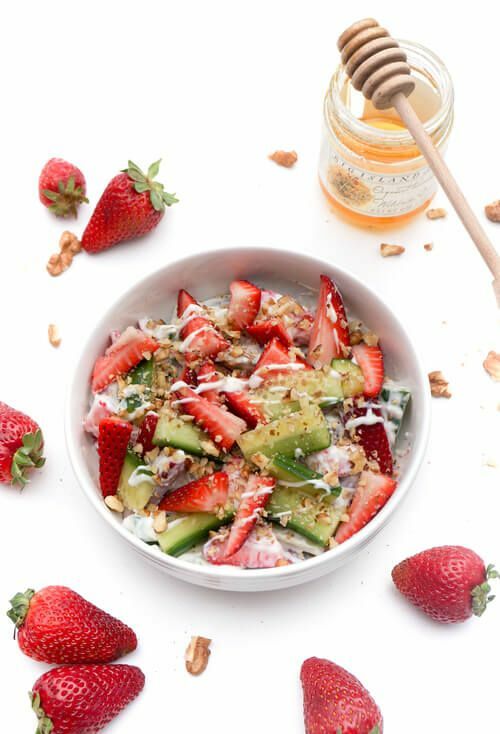 Eating more salads, such as this Strawberry Cucumber Salad with Greek Yogurt, benefits your health because of the fresh and natural ingredients. Strawberries for example, benefits eye health. They are also so sweet and delicious that they can replace sweets. Eating cucumbers flushes out toxins from the body and fights cellulite. The Greek yogurt in this salad keeps your digestive system running smoothly. It also contains more nutrition than regular yogurt. Cut stems off from 1/2 pound of strawberries; slice each strawberry. Chop 1/4 cup raw walnuts. Mix strawberries, cucumber, and walnuts together. Stir 1/2 cup Greek yogurt and 1 teaspoon raw honey together. When ready to enjoy, add yogurt and mix with the rest of the ingredients.